Maitreya will emphasize the utter necessity for peace, and that the complete renunciation of war can only be achieved by trust. Sharing alone, Maitreya will affirm, can engender that trust. Thus will Maitreya speak, thus will He foster the sense of the One humanity and the need for sharing. Needless to say, not all men will respond to Maitreya’s call for Unity and Brotherhood, but as the voice of reason and justice penetrates the hearts of men, more and yet more will see the truth of His insight and the necessity for change. Thus will it be, and thus will men awaken to the Light of Truth that is among them, and will see Him as their Leader and Guide. Gently, yet firmly, He will coax men to act in their own highest interests. Like an elder brother He will lead the younger members of His family step by step towards their own truth. This time is not far off, in truth is very near. Watch and listen for the rising voice of the peoples of the world as hope and joy alike arise in their hearts. Then will you know that the wheel has turned. That the pain of poverty and injustice will be no more. That the blasphemy of war is renounced for ever. That the Law of Love has found its rightful place in the hearts of men and women everywhere in this, our world. Q. Have the ecologists really said that planet Earth has just 15 to 20 years left? Is that an exaggeration? A. Not the ecologists but the Masters have said that we do not have 50 to 100 years (as many ecologists believe) but 15 to 20 years to rescue the planet before it reaches a stage in which the problems become irreversible. Q. Can Maitreya’s physical body contain all the consciousness of the energy of Christ, or just a small percentage of it? A. Not just a small percentage of it but yes, it does contain 85 per cent. Q. Is Maitreya a channel for the energy of Christ, or is his physical body different from ours? A. Maitreya is so pure and so advanced that He does not simply channel the Christ consciousness but Embodies it completely. It flows directly from Him to us. His ‘Body of Light’ ‘is at rest’ in the Himalayas; the body in which He manifests today is created by Himself. Q. To spread the message of Share International, I would humbly suggest that you could give more information about the Ageless Wisdom Teachings, since I have talked to people who say they like the message, but it sounds like you are “making publicity” for the Masters. It might be better to let people know more about the teachings rather than giving so much emphasis to the fact of whether someone met Jesus, Maitreya or other Masters, because it sounds to me like fantasy. A. It is no fantasy, and certainly not to the people who have the experience. Yes, we do exactly try to publicize the fact of the Masters’ return to the everyday world. Q. Would you kindly outline the practical steps nations could take to implement global sharing? A. There is a group of Masters already in the world, 14 Masters and Maitreya. They have Their disciples. These disciples have formed a series of alternative, inter-related plans, blueprints which if implemented would solve the redistribution problems at the heart of the economic problem today. The resources are there. There is more food in the world than we need, much of it rotting away in the storehouses of the developed world while millions die of hunger elsewhere. These inter-related plans would outline a very simple method of redistribution. There are various plans, but this one is the simplest and best. Humanity might or might not adopt it, but some variation of this might be acceptable. First of all, each nation would be asked to make known what they make, what they grow, what they import. In this way the total goods of the Earth would be known. Each nation would be asked to donate to a central pool that which it has in excess of its needs. The rich, powerful nations, obviously, would put in more because they have so much excess, and the poorer nations would put in less because they have less, but all would put in what they have in excess of what they need. Out of that central pool, created by all the nations, the needs of all would be met. This is taking into account the needs of the planet. We ruin, ravage, the planet. It is abused and is now sick. This plan of redistribution would take into account what we have to do, for example, in a world which is becoming more and more denuded of trees. We must plant more trees, never use beyond a certain amount. We get our oxygen from the vegetable kingdom, and at the same time the vegetable kingdom is a wonderful absorber of carbon dioxide. So the more trees we destroy, the less oxygen we have and the more ‘carbon footprints’ we make. Eighty per cent of global warming – which is an absolute reality – is created by misguided humanity itself. Then you get the American President who declares that there is no global warming, ‘It does not exist,’ he says. This, in a country which produces 25 per cent of the world’s pollution! One country produces a quarter of the world’s pollution and denies its effect. Q. In the UK recently, there has been a concerted attack on homoeopathy in newspapers and broadcasting. Statements have been made by medical men which to me sound like little more than ignorant prejudice and professional bias – a question of ‘defending territory’. I have had homoeopathic medical treatment with great success for very many years. I am not against ‘orthodox’ medicine; on the contrary, I think they should both be used as needed in a complementary relationship. What seems to be unclear to the ‘orthodox’ practitioners (and perhaps even to a few homoeopaths) is how homoeopathy actually works. Can you explain please? A. I believe that the prejudice of so many medical practitioners against homoeopathy is the result of simple ignorance of the etheric planes of energy. The arrogance with which this ignorance is so often expressed, however, is quite extraordinary. The world’s scientists, on the whole, believe that there are three states of matter: solid, liquid and gaseous. Esotericists know that there are seven states of matter: these three, and four states of subtle or etheric physical matter. These four etheric planes of matter substand all outer physical planes which are a precipitation downwards from the etheric. Each person has an etheric physical counterpart body which is first laid down in the womb before the dense physical body takes shape. When a sample of a plant or element is homoeopathically potentized, the sample becomes so attenuated that it – in a gross sense – disappears. It may be one part in many millions – clinically non-existent. What the orthodox medical practitioner does not understand is that homoeopathy does not administer a non-existent sample but the etheric energy of the sample which is released by the attenuation process. It is the energy of the sample which stimulates the body of the patient through the endocrine system. When the remedy is correctly chosen in relation to the symptoms, amelioration of the symptoms takes place. It is a science, not a ‘placebo’ as claimed by homoeopathy’s detractors, which calls forth the natural healing powers of the body itself. The success of homoeopathy in treating animals and infants demonstrates that it is not a ‘placebo’ effect which is taking place. When the existence of the etheric planes of matter are ‘discovered’ and their function understood, the prejudice and opposition to homoeopathy will cease. Two years ago , whilst ill, sitting in my living room, I watched the popular daytime programme This Morning. There was an Arabic-looking man sitting on the television hosts’ sofa. The hosts were speaking and made no contact with the man sitting there. They just appeared to ignore him. I sat wondering why the hosts had not seen him. He was dressed in a suit and sat staring into the screen and did not speak. I found this very bizarre but thought no more of it. A year later I told a healer who explained it could have been Maitreya. I have also had handprints appearing on my bedroom mirrors. The handprints were not large but in awkward positions. For three months they remained there as my heart would not let me clean them off. I just felt that they were special. Eventually I did clean them off, but they were not easy to wipe away. Who was the man on television, and did the presenters know he was there? Were the handprints on my mirrors anything significant? In mid-February 2008, our contact in the advertising department at the local newspaper The Camden Journal rang to offer us a special last-minute deal: a front-page colour advertisement for Benjamin Creme’s lecture at a very good rate, because their client had not sent their copy and they needed to fill the space. We agreed and sent it immediately by e-mail. We were pleased as the paper has a huge circulation in north London. Two weeks later, on the day of Mr Creme’s lecture, our contact phoned to say a strange thing had happened: the week after the advertisement had been published it unexpectedly appeared again on the front page – and no one in the newspaper office knew how it had happened! They were baffled: he described it as a complete mystery. (Our regular black-and-white advertisement was, as arranged, published in the same paper.) Is it possible that we had some help with this mysterious extra advertisement? 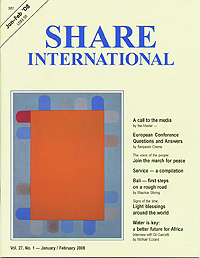 At the end of February 2008, we held our customary Transmission Meditation workshop at the Share International/Nederland Information Centre. For various reasons it had not been advertised as well as usual. First came a young woman from a Muslim background. Just as we were starting came two Moroccan women, also Muslims. The two women were somehow amusing, very chatty and pleasant. They came in asking whether this was where they could get “paranormal, para ... something or the other”. It turned out they had hoped they could get their fortune told or their auras read. I explained that we wouldn’t be doing that but that we would have the opportunity to transmit energies from great beings, Masters. How much would it cost? Nothing? Oh well then, in that case, they would stay and see. The taller woman had a strong, loud voice, was very forthright, slightly masculine, asked lots of questions and made all sorts of comments all the way through – it was pleasant and funny. She was dressed rather similarly to the way the Master Jesus had dressed once when He came to the Information Centre in the guise of a young woman. The other woman was darker, had wonderful eyes, was plump, and wore a very large cap. She was quieter and sweeter. Together they were rather a comedy duo. Two of us were giving the workshop together; we gave the background information, talked about the coming of the Imam Mahdi; we also showed a few very short DVDs of various miracles. Naturally, we began with some signs manifested for Muslims. Everyone was fascinated and wanted to know more. Then the taller woman suddenly stood up said: “You must advertise more. These things are important. People must hear these things. They should be able to know these things. Why isn’t it more widely known? Why did you only have one or two small ads? Only we saw them – they were so small.” She gestured, leaving a minute space between thumb and forefinger. “This is important for people to know. Have more adverts.” I can’t remember if she actually articulated the following, but I think she might have said something like “to give people hope”. The two jolly Muslim women left before we started Transmission! Were they by any chance Masters? C.Q. and F.E., Amsterdam, the Netherlands. My cousin George had been getting terrible headaches, so bad in fact that the ambulance had to take him to the hospital where they discovered a blood clot on the right side of his brain. The next day he was operated on. I went to see him and he was in good spirits and very positive. A few days later I called and he sounded very down, sad and worried. The doctors had told him that they would have to do another, larger operation. George told me he had total trust in the doctor and his team and had told them so. He went on to say that when the doctors left his room he saw the figure of a man, could not see his face clearly but it was definitely a man, and that he felt confident and at peace. Since he is in St Joseph’s Hospital he thought it could be a religious experience. We spoke a little about the Masters and his spirits rose. He needed long-term care. When I visited him I took the card of Maitreya’s ‘hand’ and told him to read about it and use it. He was so pleased that I brought it as he was looking for something to help him. Later, when I called, he was all excited. He said he put the card up next to his bed and placed his hand over Maitreya’s and said a little prayer asking for healing. He immediately felt electricity going into his hand (not in his body). He said he felt very peaceful, positive and happy. It lasted about ten to fifteen minutes. He was so overjoyed, he couldn’t wait to tell me and was bubbling over with joy. He said it was the best Thanksgiving holiday he had ever spent. I told him I couldn’t wait to tell my friend and he said: “Yes, tell everybody, the hand works!” Could you tell me if the figure in his room was one of the Masters and whether the help he had from the ‘hand’ card was from Maitreya? M.C., North Hollywood, CA, USA. On 2 April 2007, digital photographs taken during a mountainside ceremony in Poland to mark the second anniversary of Pope John Paul II’s death caused a stir. 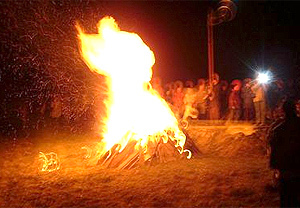 During the late Pope’s pontificate, devout Poles would light fires on Matyska mountain, in southern Poland, as a greeting to the Pope when he visited the area; since his death the tradition has become a commemorative celebration. Two beached whales in New Zealand have been rescued by a dolphin which piloted them back out to sea. The two pygmy sperm whales – a mother and her calf – had become stranded in the shallows at Mahia beach on the east coast of the North Island, a location notorious for whale strandings. Volunteers had given up hope after the whales repeatedly beached despite an hour and a half of attempts to encourage them to head back out to sea. Local conservation officer Malcolm Smith said he was about to get his gun to end their suffering when a friendly dolphin known locally as Moko suddenly appeared, swam straight up to the whales and communicated with them. They immediately followed her back out to sea through a channel. Film of a NASA space experiment being “swarmed” by UFOs has attracted almost 400,000 hits on the website Youtube. Following an interview with French aviation expert Gilles Lorant on French radio station Ici et Maintenant, his account was published on various websites of a series of United Nations meetings to discuss the UFO phenomenon. According to Lorant’s information, approximately 40 representatives of 28 UN member nations attended a series of secret meetings from 12-14 February 2008 at the New York headquarters to discuss issues of security and public information, in light of increasing UFO sightings in recent years. Lorant is an attaché to the Centre National de la Recherche Scientifique (National Center for Scientific Research), a government-funded research organization under the authority of France’s Ministry of Research. He is also a member of the Institute of Advanced Studies for National Defense and was invited to attend the UN meetings in a professional capacity. According to Lorant, the meetings were convened at the request of nation states concerned about the impact of increased UFO sightings. Their main focus was to co-ordinate international policy regarding the phenomenon; 2009 was agreed on as the year when an official policy of “openness” to extraterrestrial craft sightings would replace the denial and debunking policy pursued since the early 1950s. However, this policy shift would be dependent on certain global conditions being met: a state of “peace and stability” in the G8 nations; developing countries committed to “liberal democratic conditions”; and a continuation of UFO sightings at current levels. Dublin, Texas: Around 1 January 2008, welder Ricky Sorrells was deer hunting in the woods in Dublin, Texas, when he first saw an object above the trees so vast that it replaced the sunset sky and he could not see its edges. He estimated its size as the length of “three or four football fields”. Sorrells viewed through his rifle’s telescopic lens and describes seeing a metallic coloured object about 300 feet above him, with large round cone-shaped regular indentations, 6 feet in diameter, 6 to 8 feet deep and 40 feet apart. “While I was looking at this, it drifted to the right by about 100 feet. And I remember looking to my left to see if I could see the edge of this thing.” Suddenly it took off, he said. “It did not tilt up to take off. It remained flat and took off at a 45-degree angle. I never heard a sound. Never felt any heat … It was so fast, I still couldn’t see a shape. It was like it was here and then it was gone.” He saw the craft again twice about 1.5 to 2 miles away and it was then that he realized how huge it was. Mexico – Mezcala: A glowing UFO reportedly landed and spent more than 30 hours on the ground in a small Mexican town about 100 miles east of Acapulco. Witnesses in Mezcala, Mexico, described a saucer-shaped craft that passed over the town square slowly and silently at an altitude of about 300 metres in the early morning of 31 December 2007, before landing on a nearby hill. The craft was observed by townspeople as well as personnel at a local gold mine. While the UFO remained on the hill, it emitted flashes of light. During the evening of 1 January 2008, people in over 20 trucks tried to visit the site where the light could be seen, but the light went dark. One group came within 50 metres of the craft and described its colour as brilliant, galvanized sheet-metal, with a white or light blue light. Their vehicles lost power and stalled, however, and their camera batteries were drained, later returning to normal. UK – Portsmouth: When Hab Rahman was driving home from work one night in February 2008 he took a photograph of a lit-up car park in thick fog near his home in Portsmouth. After uploading the photograph to his computer he noticed a strange object in the picture. Near the top right of the photograph a disc-shaped object can be seen hovering in the sky. Janez Drnovek, the President of Slovenia from 2002 to 2007 who has died aged 57, was a second-degree initiate and a remarkable leader. 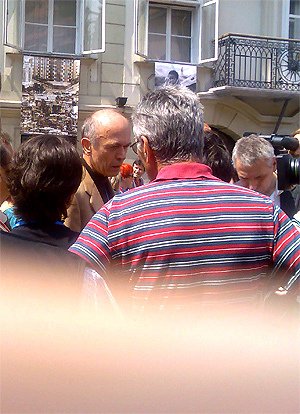 His political opponents acknowledged that he was largely responsible for Slovenia’s social and economic development. After being diagnosed with cancer he left his presidential palace in Ljubljana, dismissed most of his staff and moved with his dog to a mountain cabin near the village of Zaplana. In January 2006 he formed a group called the Movement for Justice and Development. Its aims were to “raise human consciousness and make the world a better place” and to “restrict the logic of capital and profit and provide a social as well as an environmentally more balanced world”. He also wrote a series of books with titles such as The Thoughts of Life and Awareness, Golden Thoughts, and Essence of the World, in which he explored his search for inner equilibrium and world harmony. He had recently published another book, Dialogues. “I have reached my inner peace and I am not afraid any more,” he declared. Believing he had found “a higher consciousness”, Drnovek embarked on a personal crusade against what he called “all things evil” and set out to share his positive outlook with the rest of the world. In 1993 Greg Mortenson abandoned his attempt to climb the world’s second highest mountain, K2, in Pakistan’s Karakoram mountains. On the 50-mile hike back to civilization, Mortenson got separated from his party. He spent the next seven days trying to find his way down. Tired and emaciated he eventually wandered into Korphe, a remote and impoverished village in northeast Pakistan. As a guest of the village, Mortenson was eventually nursed back to health. One evening, near the end of his recuperation, Mortenson asked the village chief, Haji Ali, if he could visit Korphe’s school. The next morning he led Mortenson up a steep village path to a frosty bit of ground where 82 children were gathered to begin their school day. Haji Ali told Mortenson that the village had no school and that a teacher had to be shared with a neighboring village. Mortenson watched that day as the children copied their multiplication tables using sticks to scratch the dirt. “I felt like my heart was being torn out … I knew I had to do something,” Mortenson said. Deeply appreciative of what the village had done for him, he promised Haji Ali that one day he would build a school in Korphe. So began a direction in Mortenson’s life more dangerous, yet more satisfying, than anything he had previously known. More than a decade later, after being taken hostage, having numerous threats made against his life, and surmounting financial as well as personal barriers, he has managed to change the lives of thousands of children and adults in Pakistan and Afghanistan. Through building schools and educating the children, he has inspired entire villages with a sense of hope for the future and a belief that peace is possible. The New York Times bestseller Three Cups of Tea is the story of Greg Mortenson’s mission. Central Asia Institute, a non-profit organization, was created with the aim of supporting and furthering his work in Central Asia. McNair Ezzard interviewed Greg Mortenson for Share International. Share International: What are the main goals of the Central Asia Institute (CAI)? Greg Mortenson: Our mission is to promote literacy and education, and to build schools, especially for girls, in remote regions of Pakistan and Afghanistan. We’re apolitical and nonreligious. Our bigger goal is to promote peace through education. I say that in the context of the subtitle of the hardcover book, which came out first. The publisher told me they would pick the subtitle: “One man’s mission to fight terrorism and build nations one school at a time”. I was opposed to that. Although I am a US military veteran and served voluntarily for two years as a medic, I started building schools and helping with female literacy eight years before 9/11. Fighting terrorism is definitely not my primary mission. In fact, it’s quite low on my list. If you fight terrorism, it’s based on fear. If you promote peace, it’s based on hope. Ultimately, the real enemy is ignorance. Ignorance breeds hatred. We have to have courage, faith and commitment to promote peace more than to fight terrorism. SI: Your book tells us there is an alternative to war and terrorism through the building of bridges and empowering the unempowered. Is that what you are talking about? GM: Yes. The work is very difficult and sometimes dangerous. Certainly, there are people there who want to promote violence, terrorism and hatred. It’s the same here in America. I get letters from people who are serving in the military in Pakistan and Afghanistan, and also from their parents. There is one common denominator in all their letters. They say that what we are doing there really means nothing unless we can help the children get into school and give them alternatives. SI: How many children are being educated at CAI schools? And can you say something about the areas where you work? GM: We have about 25,000 students now. We’ve built 61 schools that are up and running, and about three dozen more are in tents, rented rooms or halls. Basically, we’re running about 100 schools. In addition to our mission to educate girls and promote literacy, we focus on the most extreme areas where there are no schools or there is a lack of educational opportunities. Those three extreme areas are, firstly, regions of physical isolation at the frontiers of civilization, the remote mountain valleys that are very difficult to get to; secondly, areas of conflict and war, which in Afghanistan would be along the border between Pakistan and India; and thirdly, areas of religious extremism. Most of these areas are impoverished, meaning they are at the bottom of the ladder of society in terms of wealth. There are no schools. In about 80 per cent of the areas where we work, there is either no education or very little education, especially for girls. SI: CAI says that it has developed innovative techniques that encourage people to take responsibility for their own well-being and vitality. What does that mean? GM: Once we convince the people to get a school going, we provide skilled labor and free materials, such as cement and rebar [reinforced concrete], for example. They provide the free land and free sweat equity, meaning each house has to donate 10 to 30 days of free manual labor. And they provide free resources like wood, sand and crushed stone. Basically, we make a 50-50 deal with the villages. Some people see that as stingy. But when they assume responsibility and become invested in what they are doing, they have a commitment to the project. We have hundreds of villages that want a school. Compare that with the US Provincial Construction Team, the civil arm of the US military. They’ve built dozens of very beautiful schools in Afghanistan. But you go by them and there are no children in the school. Down the road about 200 or 300 yards you’ll see hundreds of children in a tent or outdoors. When I ask the children why they aren’t in their new school, they’ll say they didn’t get an order to go back there. Then I go to the district level education officer and ask him why the children didn’t come back to school. He’ll say the contractor hasn’t gotten all his money or there’s been no fulfillment of the agreement. The main problem is that from day one the communities are never involved. There is an outside contractor and a lot of money spent but the community has no idea what is going on. What the US is trying to do is a good thing. We just need to get more community involvement. You will also save money. Those schools usually cost about $200,000 to build. We can build the same school for about $20-25,000, because we get free labor and resources from the community. SI: I understand that the children in CAI schools receive a balanced education, neither fundamentalist nor slanted towards the Western world. GM: Our schools are secular. Children are taught reading, writing, arithmetic and science, just like here in the US. But there are three things that are a bit different, or non-conventional. One is that we have a storytelling tradition in our schools. That tradition is still very alive in their culture. We don’t want to eradicate that through books and literacy. Two or three times a week we have the elders come in and do storytelling with the children. They talk about their folklore, culture and heritage. We also have Islamic studies in our schools, two to three hours a week. It’s required by the governments in Pakistan and Afghanistan. Some people think this is controversial, but it’s what I call religious studies. The children learn about Christianity, Judaism and Islam. It’s more of a comparative study. We don’t promote any of the religions, but we do let the children be exposed to the differences. SI: Could you say something about the world’s illiteracy rate? GM: There is such a disparity in the world between the haves and have-nots. There are about 1 billion people on the planet who live on less than a dollar a day. There are 145 million children, ages five to 15, deprived of literacy and education, according to UNICEF. That means children aren’t able to go to school due to poverty, slavery, religious extremism, gender discrimination or corrupt governments. If we wanted to eradicate illiteracy, the global investment required would be $6-8 billion per year for 15 years. The reality is that in 2006 in Iraq, the US spent, for the Pentagon’s war on terror, $94 billion. In Afghanistan, the Pentagon budget was $14 billion. We spent $624 million for opium eradication in Afghanistan, a figure that doubled from 2005, and the opium production went up 60 per cent. In contrast, total US government funding for education in Afghanistan in 2006 was $42 million. SI: You have emphasized the importance of girls getting an education. Why is that so important? GM: There is a proverb where I grew up in East Africa: “If you educate a boy, you educate an individual. But if you educate a girl, you educate a community.” Often, boys leave the village, or they don’t send money back. But the girls stay behind. All the studies show that if you educate a girl to at least a fifth grade level, it does three things: it decreases infant mortality; it reduces the population explosion; and it improves the quality of health and the indices of life. But it takes one or two generations. A good example is in Bangladesh. In the 1960s, the female literacy rate was under 20 per cent. Then they started a nationwide campaign to eradicate female illiteracy. By the year 2000, female literacy was about 70 per cent. The male literacy rate went from 50 to 85 per cent. Another interesting impact of female education has to do with young men going on jihad. I’ve talked about Islam to many of the more enlightened, moderate Mullahs there. When a young man goes on jihad, it can mean many things. It can mean a noble quest, like a spiritual endeavor. It can mean going to a university, or it can mean joining a terrorist organization. It’s any type of quest. A young man has to get permission and blessings from his mother first. If he doesn’t, it’s very shameful or disgraceful if he goes on that jihad. He’ll be banished. If he becomes a martyr, he won’t go to heaven. When a mother has an education, she is much less likely to condone her son engaging in violence or terrorism or joining the Taliban. After 9/11, before the US went into Afghanistan in October 2001, there was a high desertion rate in the Taliban. They had a hard time getting recruits. They were going around at gunpoint targeting large swathes of illiterate, impoverished society because the educated women were refusing to let their sons join the Taliban, even at gunpoint. A US colonel in Afghanistan had another interesting observation about this. In the last year and a half, the Taliban have bombed or destroyed over 400 schools. About 90 per cent were girls’ schools. They rarely shut down, bomb, or destroy a boys’ school. Their greatest fear, and what they perceive as the greatest enemy of their movement, is the fact that when those young girls grow up and become mothers they will have lost their ideological way: the war of ideology in their hearts and minds will have been lost. The Taliban will be unable to recruit students. My Masters are developing, through Their groups, new forms and structures for your life. These will allow you better to express the Divine Beings which you are, and thus complete the Plan. Take part, My friends, in this great adventure of Spirit, and allow Me to show you, and lead you into, your heritage. Science, today, stands poised to contribute its share to the conquering of disease. The etheric planes of matter await man’s exploration and study. Therein will be found the origin of that disequilibrium of forces which manifests itself as the body’s ills. The treatment of disease will take on a new dimension when the function of the force centres (chakras) as receivers and dispensers of energy is understood and when their connection with the major glands of the endocrine system is known. Already, of course, there are those few practitioners who know this and who do valuable work, but not until this knowledge is general shall we see much advance in the understanding of the mechanism of disease. It will not be long until this research into the etheric fields begins in earnest. When it does it will transform the therapeutic situation. The new psychology, the coming science of the soul, will throw much light on the nature and cause of disease and point the way to its prevention. In time, man will learn to approach and work with the deva (or angelic) evolution, many aspects of which are deeply engaged in the healing process. I shall show you the nature of God in a new way. of life itself, the fear of your brother and yourself. walk with Me in the new Light. Life in the universe is absolute; in creation it is always relative. That is why people should not cry at death; it is not something horrible or ghastly. Their friends and loved ones have simply returned to their homeland. The books and writings received by writers through channelled sources are a sign that this message about life on the other side of death is beginning to get through to humanity. Food prices are rising around the world and inevitably hitting the poor hardest. When tens of thousands of people marched to Mexico City at the beginning of 2007, sparked by the soaring cost of maize, the protests went virtually unnoticed. “We need to feed our children,” protestors said. Now, however, the world has woken up to the fact that high food prices are prompting protests around the globe. The authorities everywhere are uneasy, knowing that outraged and hungry crowds can unseat governments. Yemen, Egypt, Morocco, West Bengal, Senegal, Mauritainia, Burkina Faso, Uzbekistan, Guinea – the list of countries witnessing food price protests continues to grow as governments nervously plan action to ward off further social upheaval. In Lebanon and Yemen food riots have already cost lives with people caught up in violent protests. In Yemen, children have marched to highlight their hunger. The Egyptian government has acted swiftly to make cheaper subsidized bread available, no doubt prompted partly by the memory of 1977 food riots that almost brought the government down. In Pakistan, the authorities have had to issue ration cards to the angry poor to enable them to buy flour. In Morocco, rioters have been imprisoned and in Jordan strikes and demonstrations forced the government to raise public sector wages. The increasing cost of grains is also pushing up the price of meat, poultry, eggs and dairy products. And there is every likelihood prices will continue to rise, according to expert predictions by the UN and developed countries. The tiny village of Kivalina, on Alaska’s northwest coast, is suing 24 major energy firms over charges that greenhouse gases the companies emit are threatening the community’s existence. Kivalina is home to around 390 Inupiat Eskimos and is built on an 8-mile barrier reef in the Arctic Circle. The villagers filed a lawsuit in a federal court in San Francisco on 26 February 2008 against the defendants including BP, Exxon Mobil, American Electric Power, Chevron and Shell Oil. The lawsuit alleges that the village faces imminent destruction from global warming because of greenhouse gas emission by the firms. It claims that climate change has caused the melting of sea ice that used to protect Kivalina from coastal storms. “We normally have ice starting in October,” read city administrator Janet Mitchell in a statement, “but now we have open water even into December so our island is not protected from the storms.” Outside experts, including the Government Accountability Office, confirm Kivalina is directly affected by climate change and that relocating it could cost $400 million or more. The suit invokes the federal common law of public nuisance. It also alleges a conspiracy by some of the defendants to mislead the public regarding the causes and consequences of climate change. It may surprise citizens of both countries but it appears that Russians and Americans share many opinions and concerns. Citizens in both the US and Russia agree that their governments should co-operate to avoid an arms race from moving into space. In Russia and America large majorities polled say they would support unilateral moves to show restraint and would like to see resolutions to keep space free of weapons. Both groups were in favour of non-interference in each country’s satellites; both groups wanted anti-satellite-weapons testing and deployment to be banned. Worldopinion.org polled more than 1,000 Americans and more than 1,500 Russians. The study was jointly developed by the Center for International and Social Security Studies at the University of Maryland, Knowledge Networks in the US and Levada Center in Russia. Large majorities in both the United States (78 per cent) and Russia (67 per cent) say that their own governments should refrain from placing weapons in space provided other countries also desist. The citizens of both countries, again in large majorities (Russians 72 per cent; Americans 80 per cent), want to see a new treaty ban on all weapons in space. Even when countered by arguments about the potential military advantages, Americans still supported a ban on such weapon development. In the US, the WorldOpinion poll indicated that such views transcended party politics; there was strong cross-party consensus on issues. Majorities in both the Republican and Democratic parties want the US government to refrain unilaterally from deploying space weapons. While there is also universal support for a treaty to ban these weapons, poll results showed more support coming from Democrats. “What is striking is the robust consensus among Russians as well as Americans, and among Republicans as well as Democrats that space should not be an arena for the major powers to compete for military advantage,” said Steven Kull, director of WorldPublicOpinion.org. “The use of space for common protection is, in fact, far more important for all countries under the circumstances of globalization than the pursuit of national advantage in performing traditional military missions,” said John Steinbruner, director of CISSM. Most people are now aware that growing desertification, which is caused by global warming, is a serious problem. 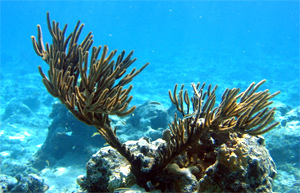 Most people probably do not know that there are sub-marine deserts. The bad news is that, just like their land counterparts, the undersea deserts, too, are expanding, due to global warming through human activity. Whereas deserts on land can easily be seen, the detection of sub-marine deserts requires the use of observation satellites which analyse the colour of oceans. Thanks to an instrument called SeaWIFs (Sea-viewing Wide Field-of-view Sensor), a satellite that has been in orbit since 1997, a team of oceanographers from the US National Oceanic and Atmospheric Administration (NOAA), have drawn a map of the major oceanic deserts and their evolution over the last 10 years. Their analysis reveals an expansion in surface area of 6.6 million kilometres (twice the size of France) of biologically inactive ocean deserts. Researchers say this expansion is “considerably faster than the forecasts established by all recent models”.